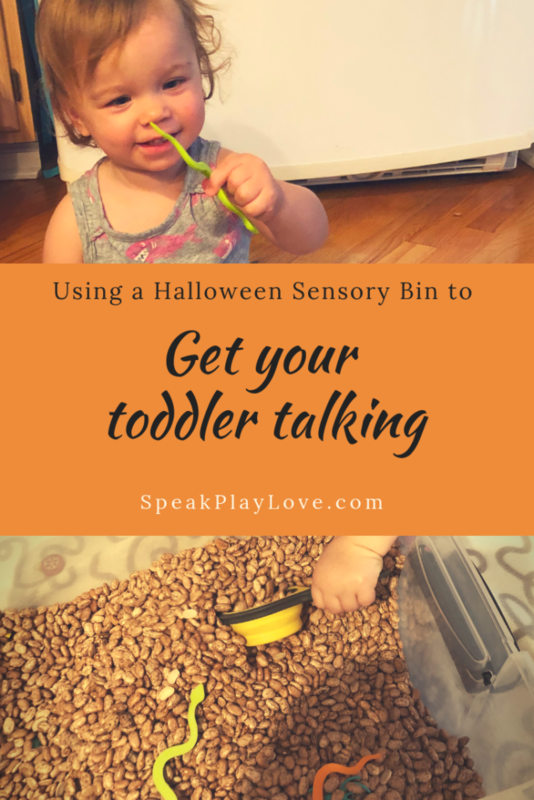 Get Your Toddler Talking with a Halloween Sensory Bin | Speak. Play. Love. 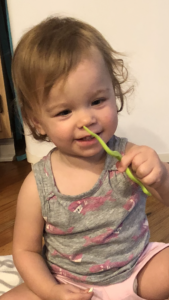 Not only was this a great interactive activity to work on language development and fine motor skills, but Sylvie also played with it independently (but supervised since she still occasionally puts things in her mouth) for 20 minutes! That means I had time to work on my computer and fold laundry while she played happily next to me – score! 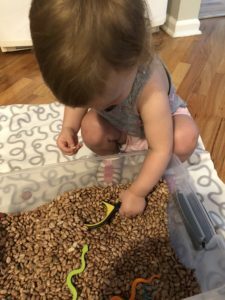 If you want more tips about keeping sensory bin messes to a minimum, check out this great post from Busy Toddler. The dollar store or the front area in Target always has new seasonal stuff, so you can trade out the hidden items periodically to keep your little one interested. Or if you want to work on specific vocabulary/concepts with your child, like animals or colors, you can put items in to target those skills. 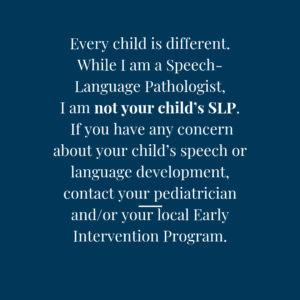 Try to narrate one, small level above from where your child is talking. 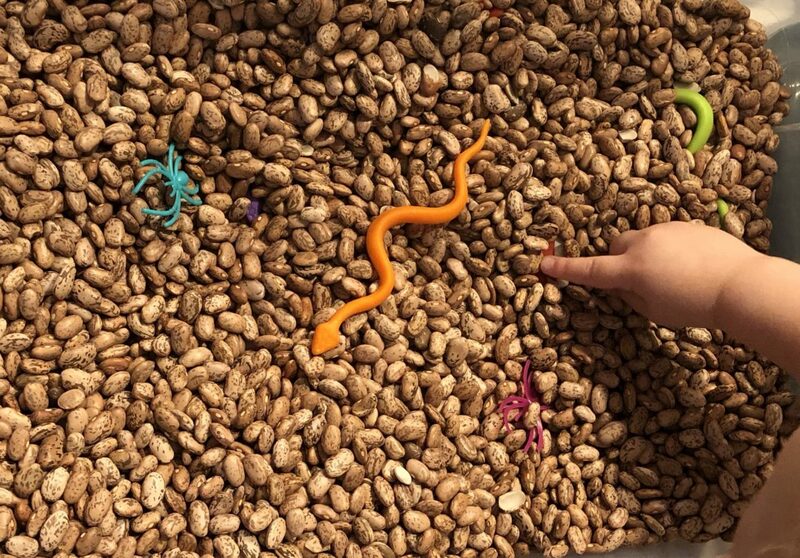 Make sounds like the hidden toys or animals: In this bin we have snakes, so lots of ‘sssss’ sounds can be fun! 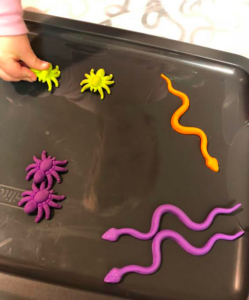 Let your child “scare” you with the Halloween creatures: building on the ‘ssss’ sound, pretend to get scared when your child wiggles the snake at you and makes a sound. 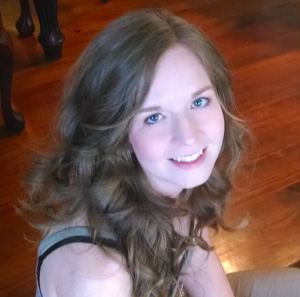 This is a great building block for conversational turn-taking and social interaction. “In” and “Out”: “Oops – a bean fell out of the bin.” (That’s why I use the blanket) You can also practice scooping and pouring in the bin. 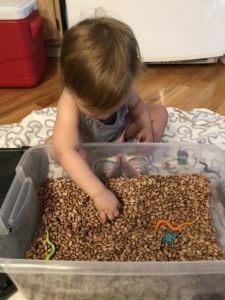 Sorting by color or animal type: As your child finds the items, have her put them in bowls or piles according to animal or according to color. 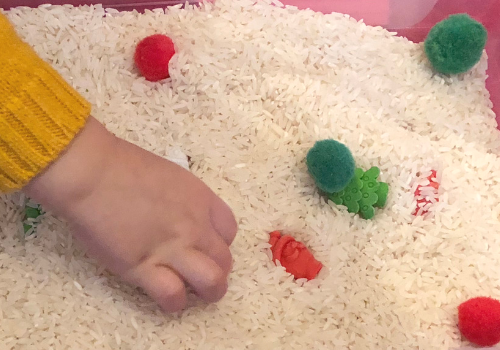 Sensory bins can be very soothing – for kids and adults! 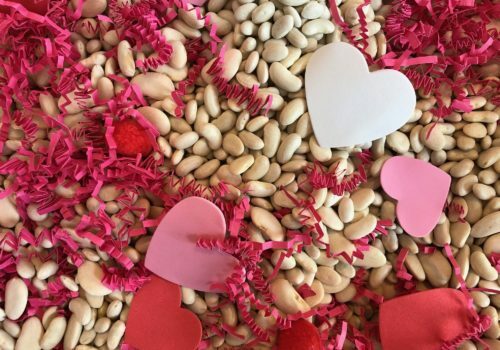 Try out dry beans, dry pasta, sand, rocks, or rice for different sensations. 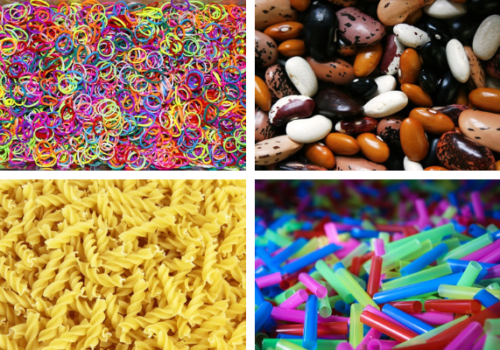 What is your favorite thing to hide in a sensory bin? Any tips to keeping the area tidy?